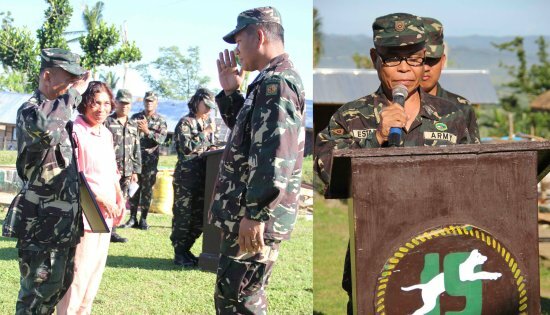 KANANGA, Leyte – Soldiers of the 19th Infantry Battalion during its regular flag raising ceremony on Monday, April 28 recognized a senior non-commissioned officer who is retiring after 31 years and seven days of struggle in the military service. Master Sergeant Benjamin Javier Estafia who hailed from St. Bernard, Southern Leyte was given certificate of recognition by Lt. Col. Nedy Espulgar for his invaluable and dedicated services to 19IB where he has been assigned months after his enlistment in the regular force of the Philippine Army on April 1, 1982. His wife, Nida Estafia also received a certificate of appreciation. As Estafia bids farewell from the military service, his colleagues in 19IB commended and thanked him, not just by his subordinates but also the officers who had learned much from him in all aspects of the military. In his parting message, Estafia tearfully recalled the hardships and sacrifices he had experienced and the various positions which he held while with 19IB. He gained positions such as team leader, squad leader and company first sergeant because of his dedication in his assigned tasks and duties. He is both a combatant and a community relations specialist. In his early years, Estafia also had survived two (2) NPA-initiated ambushes, one of which was on January 5, 1987 in Brgy. Rawis, Laoang, Northern Samar where he was wounded. "I have reached the peak of the military service and hurdled different obstacles. You can also surpass the same challenges if you, my fellow soldiers exercise the legacy of being good followers and public servants", Estafia stressed. Lt. Col. Espulgar said the service rendered by Master Sergeant Estafia is one of the longest in the history of 19IB and the hardest to achieve for every soldier. "I hope we can all retire like Master Sergeant Benjamin Estafia, whose service cannot be equaled if we deviate from the true traditions and mandate of the Philippine Army. Let us all remain steadfast to the Internal Peace and Security Plan Bayanihan and the Army Transformation Roadmap as our guides in serving the people, securing the land", Lt. Col. Espulgar concluded. CAMP LUKBAN, Catbalogan City, Samar – The 8th Infantry Division and the LGU of Catbalogan City facilitated the conduct of the 2nd Catbalogan City Youth Leadership Summit (YLS) from April 28-30, 2014 at Headquarters 8th Infantry Division, Camp Lukban, Catbalogan City, Samar. MajGen. Jet B. Velarmino, Commander of 8th Infantry Division and Hon. Stephanie Uy-Tan, Mayor of Catbalogan City led the closing ceremony that was held April 30, 2014 at Headquarters, 8ID. The three day activity was participated by 89 youths consisting of college and high school students of Catbalogan City. The Youth Leadership Summit was designed to develop and to enhance the leadership potentials of participants as well as to empower them to bring positive changes in the communities where they live. The participants of the summit underwent series of team-building activities designed to equip them with skills on how to work with others as a team. They also underwent lectures from subject matter experts about knowing oneself, the importance of family and community, leadership, human rights, environment protection, criminality and drug addiction prevention, community needs assessment and action planning. As a youth, you constitute the embodiment of the nation’s destiny, the signpost of the nation’s hope and aspirations, the emblem of our future and the catalysts of our national socio-economic growth and development,” he added. Cayetano presses De Lima: Make list public now! Expose and charge Napoles clients. Clear the innocent. PASAY CITY – Senate Majority Leader Alan Peter “Companero” S. Cayetano on Friday reiterated his call to Justice Secretary Leila de Lima to immediately make public the affidavit executed by detained businesswoman Janet Lim Napoles on the P10-billion pork barrel scam. Cayetano is asking Sec. De Lima to also verify if people on the list are in fact guilty and are clients of Napoles, or if their names are simply being dragged into the controversy. “Ito na ang sinasabi ko nung isang araw na habang hindi nilalabas ang affidavit ni Napoles, maraming mga listahan ang maglalabasan, guguluhin ang issue, at yung mga guilty ang makikinabang. Ito na nga ang nangyayari,” Cayetano stressed. Cayetano said that as early as August last year, he already said the books of his office are open to the scrutiny of the Commission on Audit (COA) for any irregularity. “Let me state once again: Not a single centavo of PDAF from my office went to a Napoles or any other fake NGO. Everything went directly to the people. In fact, as early as August of last year, I wrote the COA to audit the books of my office and I am confident that they will find no irregularity,” he stressed. Cayetano said that before the pork scam issue gets muddled even further, the Filipino people should have a face-to-face with Napoles through the Senate so that she can speak and be cross examined. COLOGNE, Germany – Display screens can be found everywhere nowadays, from kitchens to cars. Our daily life is becoming more and more digital, and consumers are accessible almost around the clock. The possibilities this is already creating today for marketing and media will be demonstrated at the dmexco World of Experience 2014 (http://dmexco.de/en/World_of_Experience.html). In this event area, visitors will be able to experience the first digital concepts and visions of the "Internet of Everything" for use in future marketing. "The showrooms of the World of Experience 2014 will be an ideal stage on which the trendsetters of the digital economy can present their marketing-related innovations and products to over 28,000 visitors at the trade fair. The interest in this event area is correspondingly strong, and there has been a noticeable increase in people's desire to find out about recent developments in a more tangible way. We have received numerous inquiries from all segments of the digital economy, and these inquiries have become more and more specific during the many in-depth discussions we have held," according to Christian Muche, dmexco Director Business Development, Strategy & International, and Frank Schneider, dmexco Director Marketing, Sales & Operations. The dmexco World of Experience 2014 will focus on the "Internet of Everything," a key future trend that is increasingly impacting many technologies and segments of innovative sectors such as the auto industry, healthcare and consumer electronics. This trend is creating a new dimension of daily life that is rapidly becoming more and more important for digital marketing and media. The unique concept of the World of Experience will show what opportunities are already available for those who wish to venture into these new dimensions. Through its showrooms the World of Experience will effectively augment and enrich the existing trade fair at dmexco 2014. As our daily life becomes progressively digitised, marketing, media and advertising are no longer found only on TV, desktop computers, laptops, smartphones and tablet computers. Instead, the focus is now on the "connected life" and on individual lifestyles, irrespective of the channels, screens or terminals that are being used. As a result, advertisers and agencies will have many more options, as well as completely new ones, to successfully optimise the way they target customers at all touchpoints of the consumer lifecycle. However, before the sector can exploit this huge potential, it has to address the challenge of developing innovative new concepts that work on all channels and successfully create new points of contact to the consumer. Valuable inspiration in this regard will be provided by the World of Experience at dmexco 2014, which will be organized completely in line with this year's slogan, "Entering New Dimensions." "Many current developments indicate that all of our surroundings and daily routines will soon be digital. That's why our sector can and must present its products and solutions in a more tangible way that better illustrates the associated complexity to market partners and ensures that we will continue to be visible and successful in the future," according to Christian Muche and Frank Schneider. "The dmexco World of Experience 2014 will be exactly the right place for this purpose. After the successful pilot project in 2013, we will now provide trendsetters from the digital economy with their own attention-grabbing world of experience in Hall 6, where they can demonstrate key trends and enable visitors to experience marketing-related innovations and products in a tangible and vivid way. We are already looking forward to offering our guests and visitors more service and innovation in the expanded World of Experience. This kind of service can only be found at dmexco!" QUEZON CITY – “The GPH cannot escape the fact that the Joint Agreement on Safety and Immunity Guarantees (JASIG) is operative and JASIG-protected persons are immune from arrests, including recently arrested NDFP consultant Wilma Austria Tiamzon,” declared Cristina Palabay, secretary general of Karapatan. Palabay made reference to the DND-DILG ORDER ON REWARD NUMBER 14(A)-2012 issued on December 12, 2012 amending earlier DND-DILG Joint Order Number 14-2012 stated, “Pursuant to the Joint Agreement on Safety and Immunity Guarantees (JASIG) dated 24 February 1995 and the current GPH list of JASIG-covered personalities, the following names are to be deleted from DND-DILG JOR Number 14-2012 in recognition of the pending peace negotiations and conditions upon the existence of said peace negotiations”. The amendment ordered the deletion of names of Wilma Austria Tiamzon, Rafael Baylosis, Vicente Ladlad, Reynaldo Bocala and Jose Maria Sison from the list of so-called 235 “communist personalities” who are targets of arrest or neutralization, with corresponding reward money. Except for Sison, who is NDFP chief political consultant, all are consultants in the GPH-NDFP peace negotiation. "Alex Padilla, head of the GPH peace panel and Justice Secretary Leila de Lima do not know what they were talking about when they said the Tiamzons were not immune to arrests. Here is the proof," Palabay said. “The contradictory positions taken by the government reflects its deceit in negotiating with the NDFP,” she added. “The list of deleted persons is incomplete,” Palabay said as there are 14 NDFP consultants who are detained on numerous trumped up criminal charges, including the Tiamzon and Austria. Under BS Aquino, a peace consultant was convicted for the first time. Eduardo Sarmiento, who hails from Samar, was sentenced 40 years imprisonment in December 2013 for trumped up charge of illegal possession of explosives. There are also 13 NDFP consultants and staff who are victims of enforced disappearance. 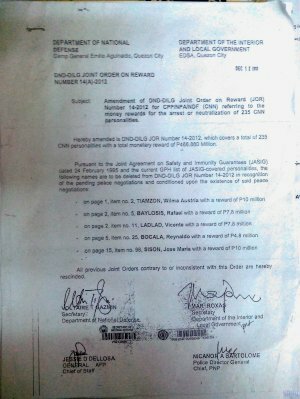 The DND-DILG Joint Order Number 14-2012 is a hitlist akin to Gloria Arroyo’s Order of Battle used in the implementation of her Oplan Bantay Laya. In the said list, Benito Tiamzon and Wilma Austria-Tiamzon have a 10 million-peso reward each on their heads. Karapatan considers the reward system an “organized racket” of the AFP and the PNP and called on the government to scrap the said order. “The GPH should take responsibility in stalling the peace negotiation with its double talk,” said Palabay as it reiterates Karapatan’s calls to: Resume peace talks with the NDFP! Release all detained NDFP consultants! Surface missing consultants and staff! 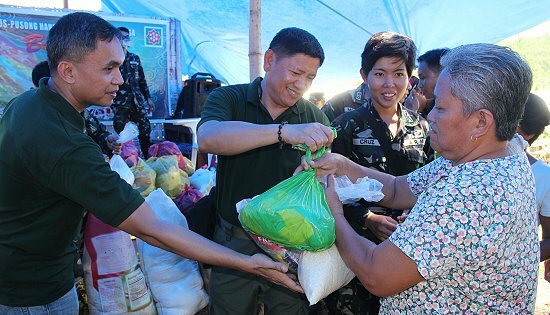 CAMP LUKBAN, Catbalogan City, Samar – The 8th Infantry Division, Philippine Army conducted relief goods and Hygiene kits distribution coupled with free medical and dental consultation and services in the three towns of Eastern Samar last April 22, 2014. MajGen Jet B Velarmino AFP, the Commander of 8ID spearheaded the activity in distributing food packs and Hygiene kits courtesy of UNILEVER Philippines to around 878 super typhoon Yolanda victims a tBrgy. Roxas, Giporlos; Brgy Sta Rosa, Balangiga and Brgy 10, Poblacion, Lawaan all of Eastern Samar. Each pack contains three kilos of rice, canned goods, and hygiene kits from UNILEVER Philippines. The AFP Commissary and Exchange Service based at Headquarters 8ID also joined the activity and supplemented assorted clothes, noodles, biscuits, chocolate drinks and hygiene kits. Adding to the excitement of the activity was the giving away of chocolates to children living in the three barangays. When one child was asked to say something about the chocolate, she said: “Syahan ko nga makakaon hin sugad hine karasa nga tsokolet!” (It is my first time to have a taste of this type of tasty chocolate!) The chocolates were donated by students of an academic institution for children based in the USA. In addition to the gift giving, 8ID medical team led by Lt. Col. Reynaldo R. Cruz, Commanding Officer of Camp Lukban Station Hospital also rendered medical consultation and dispensed medicines, while Dental team led by LtCol. Luther A. Punzalan, Commanding Officer of 1368th Philippine Army Dental Detachment based at Headquarters 8ID rendered tooth extraction services, for a total of 301 medical and 147 dental beneficiaries in three Municipalities of Eastern Samar. The chief executives of the three barangays were unanimous in expressing their appreciation to the effort of 8ID. Note: The chocolates distributed during the activity cited in the last sentence of the fourth paragraph were donated by students of Montessori International School located in 1230 N. Gilbert Road, Mesa, Arizona, USA thru the effort of Ms. Therese Kestner, School Director. 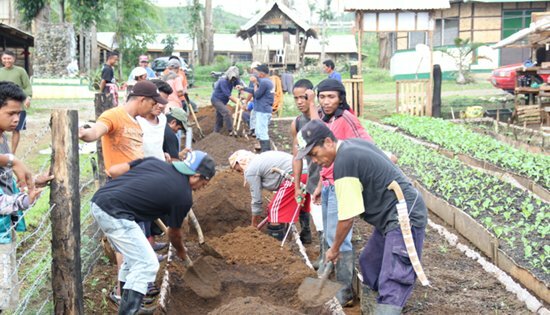 Members of the Libertad Farmers Association demonstrated “double-dig” method in preparing the planting area. KANANGA, Leyte – Fifty-five members of the Libertad Farmers Association attended one-day training on organic farming technology at the 19th Infantry Battalion’s camp in Brgy. Aguiting, Kananga, Leyte on Wednesday, April 16. The training was part of the military’s continuing support to established people’s organizations in selected towns in Leyte, which aimed at uplifting the lives of its members. During said training, the participants learned how to make various types of “contusions”. These are organic extracts made out of plants and other indigenous materials which may be used as plant growth enhancer, pesticide and soil conditioner. Contusions are made up of bacteria created through fermentation process and can also enhance the fertility of the planting area. While contusions enhance plant growth, land preparation according to lecturer Mayang dela Cruz, is also equally important and is one the fundamental requirements in organic farming method. In organic farming, “double-dig” method is highly recommended when preparing the “plant beds” as it prevent plant roots from stress and improves retention of nutrients needed by plants for several years. All these organic farming methods and technologies were stirred by Mr. Gil Carandang, the Father of Philippine Organic Farming who mentored 19IB and its clienteles during series of workshops on “Sustainable Integrated Organic and Natural Mini Farm Program” sponsored by the Land Bank of the Philippines. The training was also graced by Hon. Elmer Codilla, the Municipal Mayor of Kananga, Leyte who pledged support to the constituents of Brgy. Libertad. Mr. Troy Bumagat, proprietor of the Trophy Farm in Kananga, Leyte also distributed 80 kilograms of organic rice seeds to the association. The said seeds were accordingly provided by the regional office of the Department of Agriculture. Mr. Bumagat will also be giving high yielding variety of corn seeds to the same farmers association. The Libertad Farmers Association was the first communist-inspired farmers group in Kananga, Leyte organized way back in 1992. The New People’s Army established the group purposely to intensify the influence of the communist rebels in all of the 23 barangays of the said town. The group was disintegrated when its key leaders surrendered to 19IB in 2006. In later part of 2012, 19IB moved to reorganize all groups that were left after the fall of the New People’s Army in Leyte. Libertad Farmers Association was one of the organizations which were officially registered in the Department of Labor and Employment (DOLE) in 2013, through the effort of 19IB and 802nd Infantry Brigade. Lt. Col. Nedy Espulgar, commanding officer of the 19th Infantry Battalion said the military will continue to train and provide available support to all of its established people’s organizations in Leyte. 19IB is also engaging government agencies, Non-Government Organizations and even the private sectors in order to address the needs of its established people’s organization which turned away from the communist ideologies. As of now, the military is supporting 10 people’s organizations namely: Taglawigan Farmers Association, Taglawigan Fisher Folks Association and Catoogan Farmers Association in San Isidro, Leyte; Cabatoan Farmers Association, Airport Farmers Association, Jubay Farmers Association and Sorosimbahan Farmers Association in Calubian, Leyte; Rubas Farm Producers Association and Rubas Farmers and Tourism Developers Association in Jaro, Leyte and Libertad Farmers Association in Kananga, Leyte. KANANGA, Leyte – Lt. Col. Nedy Espulgar, commanding officer of the 19th Infantry Battalion said the military will continuously assist the former rebels and will urge more to include their relatives, to avail and intensively implement LBP’s mini farm program. This was the military official’s commitment, in his avid interest to help their former enemies, the former rebels, during the visit of Mr. Domingo Diaz, LBP Director and Mr. Gil Carandang, the Father of Philippine Organic Farming in 19IB’s camp at Brgy. Aguiting, Kananga, Leyte around 10:00 a.m. of Saturday, April 12. Diaz and Carandang together with other LBP staff stayed one and a half hour at 19IB camp. They were warmly welcomed by the military and by the 20 former rebels who also helped 19IB in all the preparations. The duo’s visit was arranged purposely to evaluate the status of the model organic garden for all of the clusters held by the military in the “Bangon Sustainable Integrated Natural Organic Mini Farm Program”. The 300 square meters commando organic garden which is a parcel of the “Bangon Alpha Kananga Cluster” has also passed the standard protocol of the mini farm program as surveyed by Carandang. With the said project, 19IB will be maintaining four (4) out of the 11 clusters organized by LBP through the Land Bank Coutryside Development Foundation Incorporated (LCDFI). The four (4) clusters are Kananga, San Isidro, Calubian and Jaro with a planting area of not less five (5) hectares. The mini-farm program is specially designed for vegetable growers. Under the said concept, a grower is guaranteed to gain a net monthly income of not less than P10,000 in a 1,000 square meters farm area. In the said farm size, raising swine and poultry may also be integrated. Also in this concept, vegetable growers will learn the methods of land preparation and management as well as formulating natural fermented solutions to enhance the growth of vegetables and to control pests and diseases. Lt. Col. Espulgar believed that the mini farm concept is the ultimate tool that can be a show window to best address the dilemma on poverty thriving not just in former rebels but also in most communities. Director Diaz, during the second follow-up session on the “Sustainable Integrated Natural Organic Mini Farm Program” held at Brgy. Lemon, Capoocan, Leyte on Friday, April 11, said the LCDFI was initially negotiating the leading malls in Cebu as potential market for all vegetables which will be produced later by the clusters. HONG KONG, China – Better returns, less regulation and more diversification are the key drivers among Asian investors when they buy overseas property, according to speakers at a panel discussion during the recent Colliers International Asia Real Estate Investment Forum in Hong Kong. They referred to the "three waves" of Asian investors who have entered the global arena: (1) long-term institutional ones seeking bond-like yields, (2) high-net-worth individuals with a shorter time horizon and willingness to take higher risks, and (3) developers pursuing short-term trading opportunities and willing to take higher risks. Goodwin Gaw, Founder and Managing Principal, Gaw Capital Partners, explained that stable yields in certain overseas markets, greater liquidity in China, a desire to diversify, and the Chinese government's encouragement of overseas investments were all adding momentum. Meanwhile, the panel members observed that investors may face risks if they build large projects in North American cities that already have sizeable Chinese communities. "You're going to create mini-Chinatowns in those cities, and there may be a backlash," Gaw warned. Asian investors are attracted to the UK because its tax regime is easier to understand and the small spread between borrowing and yield. Also, the similar legal system makes it especially suitable for Hong Kong investors. London property prices didn't decline during the last financial crisis, although they might in the future. Robert T. Lie, Managing Director, Real Estate Group, CITIC Capital, cautioned that the city's economy is for a large part based on the financial industry, like Hong Kong's, and property there is expensive. "Asian investors need to understand the changes taking place in London and what it will be like in the future. Otherwise, they might lose out if their timing is wrong," he added. Speakers emphasised that Asian investors must take time to understand the characteristics of any market they intend to enter, although one speaker declared that China's top developers are already smart in their approach. The panel members opined that the cumbersome US regulatory environment could be advantageous to investors, because it mitigates supply risk. Yet they should remain cautious while quantitative easing is being unwound, because it could cause further volatility in the market.